Giveaway! Mojo Bazaar Handkerchief Home | About Us | Opportunities | Sponsorships | Contact Us! This week we’ve teamed up with Mojo Bazaar to give you the chance to win one of their amazing brand new men’s handkerchiefs! These hankies are created using top of the line fabrics in designs that compliment and draw interest to any masculines style. From dapper to casual, having a handmade handkerchief tucked in to your shirt, coat, or back pocket comes in handy in countless ways. Take a few moments to check out ‘The Avenue Handkerchief’ up for grabs, then put your name in the giveaway for up to 60 chances to win! Woven from 100% high quality chambray. The nature of this cotton emits a soft, yet pliable handkerchief. The tight weave maintains its durable construction. 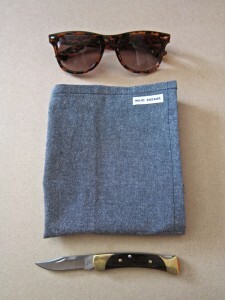 Its gritty yet clean granite tone is adaptable to any casual street attire. Jeans, khakis, corduroys. You name it. 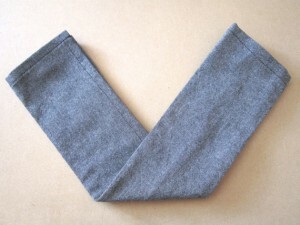 Surely, there’s a two-piece suit out there that would compliment this hanky quite nicely. Think: the weekend version of 007. The Avenue Handkerchief is ready to serve at any given moment. Pretty spiffy, don’t you agree? Use the handy entry box below and get up to 60 entries in under a minute! Tagged Giveaway. 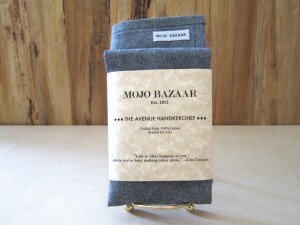 Mojo Bazaar, Handkerchief. Bookmark the permalink.